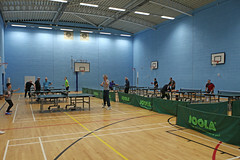 Home of New Milton TTC on the web! 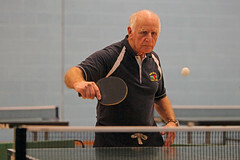 In the second week of the Bournemouth and District Table Tennis league, the New Milton club doubled their week’s tally of wins to four, albeit one of them came from a “no-show”. The other results were four draws and just the two defeats last week. In the Premier, the A team (Brian Bickell, Brian Vibert and Steve Hemmings) got back to winning ways with a 6-4 away victory over newly promoted North Bournemouth A. Captain Vibert and Bickell won two apiece and Hemmings chipped in with the one win. 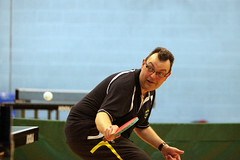 The doubles were required for the win and the two Brians duly obliged in three straight sets. Div 1 saw the B team (Zoltan Karib-Barath, Julie Smillie and Bob Fagan) gifted four points as Broadstone A failed to show at Mudeford Wood due to a confusion over dates. Milton made an evening of it with some welcome practice and had an early night. Also in Div 1, the C team (Jacob Tse, James Lewis and stand-in Matthew Daish) lost their second match in a row, but this time with the improved scoreline of 4-6 away against Merton B. Captain Lewis got off the mark with a brace after his last week’s duck and Tse matched his captain’s tally. Just shy of his 11th birthday, Daish played all the way up from Div 3 with great maturity with two of his matches going all the way to five ends. The doubles would have forced the draw, but Lewis and Tse lost in three straight sets. In Div 2, it’s won one, lost one for the D team (Terry Jenvey, Roy Hobbs and Peter Eke) as they lost 3-7 at home to Merton D. The trio shared the spoils with one apiece which was good enough for the point. Div 3 saw the E team draw 5-5 for the second week in a row, this time at home to Merton F. 18 year old Max Doohan got his campaign off to a good start with a hard-fought hat-trick, and captain Bev Scott-Johns and Bill Page chipped in with one apiece. 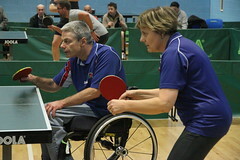 The doubles would have brought victory but Doohan and Page lost in three straight sets. The F team (Sylvia Smith, Frank Handy and Dave Sutton) also drew 5-5 in Div 3, theirs coming at home to Lynwood C. Handy devastated the opposition with a barnstorming hat-trick, only dropping one set in the process. Sutton just missed out on a brace by losing 9-11 to ex-Miltonian Mick Barry in the fifth and final set, but captain Smith drew a rare blank. Once again, the doubles proved decisive as Handy and Sutton won over four ends to force the draw. The club’s only Div 3 side to win was the G team with a 6-4 away victory over Bournemouth Sports L. Captain Malcolm Nash led from the front with an excellent hat-trick, and Lewis Reading and Simon Daish added one each to the tally. 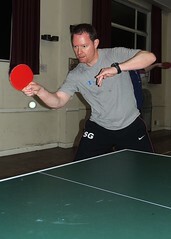 Nash crowned a good evening by joining with Reading to take the doubles for the win. 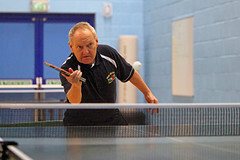 In Div 4, the H team (Bobo Jiang, John Parkhouse and Andrew Daish) improved on their first week defeat by holding Bournemouth Sports P to a 5-5 draw in their own back yard. The trio all lost to Bourne’s very experienced captain, Gavin Coppard, and Parkhouse only just missed out matching his teamates’ brace by losing to Coppard’s son Andre in the fifth and final set. Jiang and Parkhouse came close in the doubles but lost the fourth end deuce at 10-12. The fourth of the club’s draws came in Div 5 as the J team, buoyant from their maximum-pointer last week, were held to an away tie against Bournemouth Sports R. 16 year old Luke Gurton played really well again to bag his second brace in a row to match captain Malcolm Douglas’ return, and Sammy Watkins notched up the one win. A second win looked to be on the cards as Douglas and Gurton took the first end of the doubles but then they lost the next three. Also in Div 5, the K team of brother and sister Michael & Lucy Craddock and Richard Ursell recovered from last week’s opening drubbing with a sensational 7-3 home win over Winton YMCA D. 14 year old Lucy only made her league debut last week and got off the mark this week with an excellent couple of wins, as did big brother Michael. 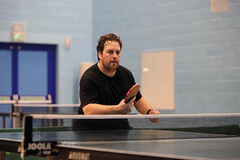 Ursell came up with his first ever league hat-trick by dropping only one set all evening. Posted on 13/10/2011, in 2. 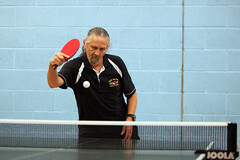 League Reports and tagged btta, club, new milton, new milton table tennis club, Table Tennis. Bookmark the permalink. Leave a comment.